Boulder Public Library offers Sensory Friendly Storytimes upon request. Sensory Storytimes are specially designed storytimes tailored to meet the needs of youth with sensory issues and their families. These storytimes will engage children through movement, music, stories and play. 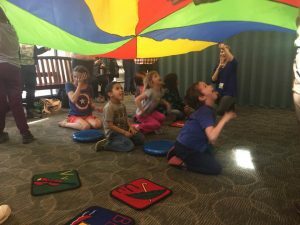 While open to all children, sensory friendly storytimes are especially geared to children on the autism spectrum, those with sensory integration challenges, or children who have difficulty sitting. If you are interested in booking a Sensory Storytime, please fill out our Request a Class Visit Form and include which of the four storytimes would like in your request. Learn more about our other storytime programs. A special thank you to the Boulder Library Foundation for funding this storytime and to our collaborators for providing guidance and volunteers.